One of the things I love most about Yin Yoga is its connection to the elements of nature. This comes from the special influence of Chinese Medicine upon Yin Yoga, and it helps practitioners bring nature, the environment, natural forces, and seasonal cycles into our practice. In Chinese Medicine, energy is deliberately stimulated along the meridian lines that run throughout the body. In Yin Yoga, the theory is that we stretch the body along these same meridian lines, which produces something like a self-acupressure effect. Each of the main organ meridian pairs is connected with one of the 5 Elements: Water, Wood, Fire, Earth, and Metal. In turn, each of the 5 Elements relates to one of the 5 Seasons…yes, 5 seasons! In this system, the Earth Element has its own season outside of the four we traditionally recognize in Western culture. The Late Summer/Early Fall transition is the time of Earth Element, which coincides with the peak of the harvest. You can recognize attributes of Earth Element in your environment at any time, but we bring them into greater focus during this short season of the year. These qualities include hardness and solidity; Earth Element gives structure and support. 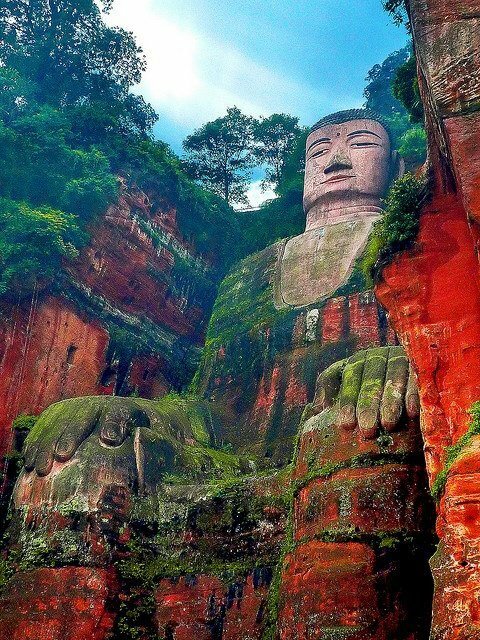 In traditional Buddhist meditations on the Elements, one would contemplate the hardness of the bones, the structure of the skeleton, the mineral quality of the teeth, etc. to experience the Earth aspects of the human body – the same Earth qualities we observe in mountains, rocks, and geological structures that shape the planet itself. In nature, the Earth Season is a time of abundance. For us, it is a signal to slow down and take in the fruits of our labors – the results of our efforts in Spring and Summer. If you’ve read earlier posts about Spring/Wood Element and Summer/Fire Element, you know that these times of year are actively involved with initiating change and bringing plans to fruition (analogous to planting seeds and growing crops). 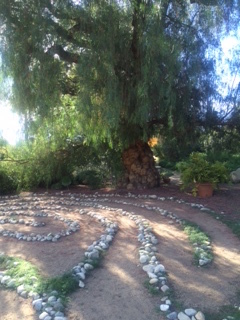 Grounded in the strong foundation of that work, we now enjoy greater equanimity and begin to sense more self-acceptance, integration, gratitude, and contentment as we arrive at the harvest. The organ meridians involved with Earth Season are the Spleen (Yin) and Stomach (Yang) Meridian pair, which are related to digestion and both the physical and emotional sense of satisfaction and “enoughness.” The Spleen is also part of the immune system, and along with the Stomach, it affects how we accept or reject food and germs, as well as how we process information and emotional energy from others. In your Yin Yoga and meditation practice, you can highlight Earth Element in a variety of ways. The solidity and stability of props like blocks, bolsters, and blankets can be seen as an expression of Earth Element – the weight of sandbags can be especially grounding. In your Yin (and Yang) sessions, you can choose poses that affect the Spleen/Stomach Meridians (quadriceps, inner leg, abdomen), such as Cat Tail Pose shown above or Half Knee to Chest on a Block shown on the right, with a sandbag on the extended thigh (if appropriate for you). Grounding through the feet and legs in your standing poses, or massaging the feet can also be great ways to heighten the connection to the Earth they stand on. I particularly like Standing Meditation and Walking Meditation for emphasizing Earth Element. As you stand (as in Mountain Pose), or move in slow walk, you can sense into your bony structure to feel Earth Element manifested in your own form. You can also soak in the calming, grounding effects of your feet touching the Earth. Check this earlier post on Earth Element for further instructions on Walking Meditation. Enjoy! I love to celebrate the changing of each season. Marking the shifts in the weather, the daylight, and the foods that are in season are all wonderful ways to reconnect with this amazing planet we inhabit. But, I have to admit…I dread summer every year. I am not a fan of hot temperatures (or sweating), so this time of year, I have to make a little extra effort to appreciate the cycles of nature (rather than just curse the Weather Channel forecast). When it’s hot outside, my patience is thinner, my energy is lower, and it’s hard to stay grounded in the present moment when I’m longing for the days of sweatshirts and chai tea lattes. After the 4th of July, I’m seriously ready to skip ahead to Halloween. Please. Fortunately, I’ve learned a few things over the years about working with the Elements and Seasons from a Yin Yoga perspective, so I’ll offer some of my favorite practices for handling the sizzling energy of summer. First, a little background: Yin Yoga draws upon the energetic principles outlined in Traditional Chinese Medicine (TCM). The poses we practice are thought to stimulate the meridian lines that run through the body, making the practice a form of self-acupressure. The meridian lines we take into consideration in Yin Yoga are each connected with an organ in the body, and the organ meridians are divided into Yin and Yang categories. Each Yin organ meridian is paired with a Yang organ meridian that has similar qualities and effects. In addition, each meridian pair is associated with one of the Five Elements and a season of the year. In TCM, summertime is connected with the Heart/Small Intestine meridian pair and the Fire Element. 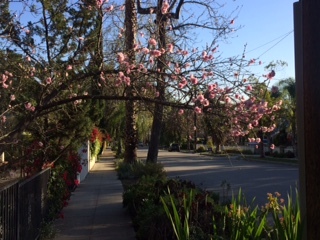 Each season has its own unique personality, bringing with it certain moods or characteristics. In the winter, rest and hibernation is instinctive, and in the spring, change is in the air, as new habits and ideas start to blossom. The summer season represents the part of the cycle where everything ripens. 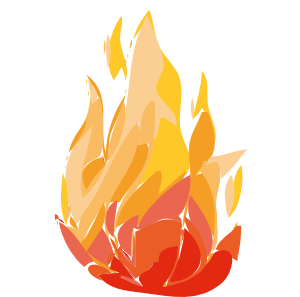 The heat of fire can purify or burn away old habits, “cooking” our new intentions until the transformation reaches maturity. Fire energizes, but it also consumes, so it’s crucial to keep this energy in balance – it brings out one’s fiery intellect and passionate emotions. But, on the plus side, Fire Element also highlights our capacity for compassion, joy, and connection. The expansive energy of Fire encourages us to embrace living life to its fullest. How do we work with these themes in a yoga practice? According to Chinese Medicine, the Heart and Small Intestine Meridians are related to both circulation and digestion, as well as any inflammation in the body or excess heat (such as hot flashes). Anxiety, nervousness, and overstimulation can also reflect imbalance in these meridians, and in turn their symptoms include disruptions to digestion and heart rate. Described in broad strokes, the Heart Meridian starts around the chest/armpit and runs down the inner arm, through the wrist and to the pinky finger. The Small Intestine Meridian – perhaps surprisingly – is also located in the upper body, running through the neck, upper back/shoulders, and down the back of the arm. So, in a Yin Yoga practice, these energy lines would be primarily affected by backbends, forward bends, twists, and wrist/forearm stretches. You can choose poses that open the chest, upper back, neck, and shoulders, and the inner and outer arm from the pinky to the shoulder. Try a restful backbend on a bolster, or add wrist and shoulder stretches to Shoelace Pose (see pictures). In general, summer can be a good time to turn down the heat and intensity of your asana practice and spend extra time with Yin Yoga and meditation, or simply opening to the emotional aspects of yoga. Practicing Metta Meditation can be a beautiful way to cultivate the positive attributes of Fire Element – love and compassion – and to soothe your own heart. Metta (or Maitri in Sanskrit), means “loving-kindness” or goodwill, and is a traditional Buddhist meditation practice. This form of meditation is usually taught with a set of four phrases that are repeated silently – “May I/you be safe,” “May I/you be happy,” “May I/you be healthy,” “May I/you live with ease.” You are free to create your own variations of these well-wishes that resonate with you. If you’re new to Metta Meditation, try this guided practice with Sharon Salzberg. She will guide you through the nuances of sending Metta to yourself and to others. My good wish for you this season: indulge in some lazy summer days to rest and stay balanced. Enjoy being with friends, live life to the fullest…and stay cool! P.S. Check out the other articles in this Elements/Seasons series! Spring & Wood Element and Late Summer & Earth Element. Long before humans peered through microscopes to discover that the world is constructed out of particles like atoms, molecules, and DNA, ancient peoples recognized the same principle – that every object is made up of many smaller parts coming together to form a whole. Taoism, Buddhism, and Ayurveda each describe how the Elements (materials and forces found in nature, including Air, Water, Fire, Earth, etc.) compose the human body and every object on our planet…as well as the planet itself! The Elements are an interesting framework for viewing our yoga practice on many levels, as they relate to the physical health of the body and energetic system, emotional and psychological balance, philosophical principals about the nature of Self, and our connection to our environment. In Chinese Medicine, the Elements are also associated with specific seasons of the year, and can help us practice yoga in a way that’s in tune with the rhythms of nature. The patterns of the seasons are also reflected in our own body’s energetic rhythms. When we practice with the elements, we remember that we humans are not separate from this Earth. The Winter is a time of internal focus, when we are like seeds buried underground preparing to sprout. Once Spring arrives, the Wood Element represents that sprout emerging. The Wood Element energizes us to initiate transformation. This is a time of starting over, a rebirth of sorts. This fresh start can come with growing pains and frustrations, as it takes time for our new projects and ideas to take root. In the Spring, we can benefit from cultivating “beginners mind,” and being flexible as we plan and organize the new visions that arise. If you practice Yin Yoga, include poses that target the Liver/Gallbladder Meridians, which are associated with the Wood Element, and thought to help balance the tendency toward impatience as we initiate changes in Spring. These poses would be your side bends, hip openers, and stretches for the inner leg, including Shoelace, Square Pose, Swan Pose, Banana Pose, and Dragonfly (among others). In your practice in general, look for ways to channel your active thinking mind – it may be in overdrive with all this new Spring energy! Concentration techniques in meditation (like counting the breaths) can help, as can breathing exercises that lengthen the exhales. The soothing qualities of the exhale can help calm the nervous system. Here’s an audio I recorded about a year ago entitled “Extending the Exhales” – give it a try! Enjoy the fresh starts that Spring brings. Take steps forward and initiate transformation, but keep things in perspective and practice patience. Spend time outside in nature, and be sure to give your creativity some outlets. 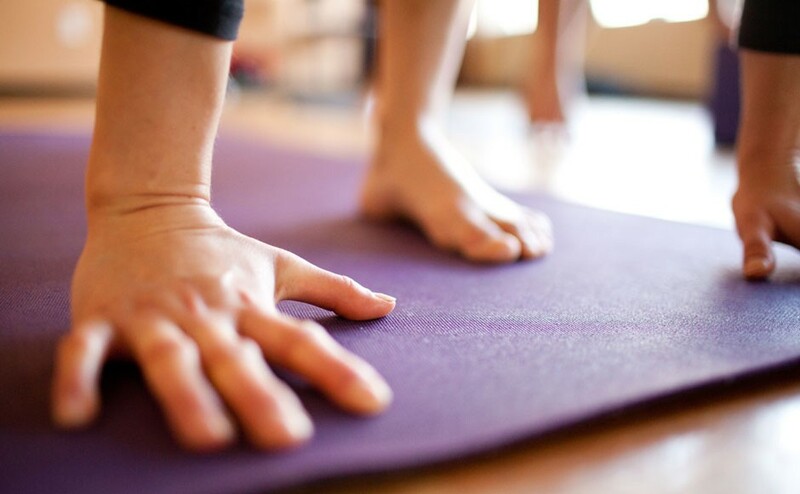 What makes a yoga practice “mindful”? I’ve been thinking about this question for a while (thus the existence of my blog), but especially since I came back from the first 10-day retreat in the year-long Mindfulness Yoga & Meditation Training program at Spirit Rock Meditation Center last fall. The purpose of this program is to weave together the distinct, yet related, contemplative traditions of Yoga and Buddhist Insight Meditation into a powerful integrated practice. And, it does feel pretty different from most mainstream yoga classes. You might ask: “Isn’t all yoga mindful?” And I get where you’re coming from. Then why do we need this label “mindful yoga” to distinguish one approach to practice from others – are we implying that everyone else is doing “un-mindful yoga”? (Hopefully not.) But, just because something is called “yoga” doesn’t automatically guarantee that it’s helping us grow in our capacity to live mindfully. What I mean when I describe a yoga practice as “Mindfulness Yoga” is that we are making mindfulness the centerpiece and focus of the yoga practice. Different types of yoga emphasize different aspects – some focus on tuning up the health of the body, or improving one’s fitness, and others are primarily concerned with reducing stress. In each of these, mindfulness is still there, but it may be more of a background feature. In Mindfulness Yoga, we do the physical asana practice in a way that brings the development of mindfulness to the foreground. 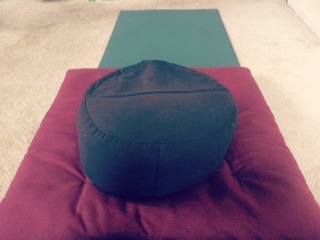 Our practice also serves to prepare the practitioner – in body, mind, heart, and energy – for formal meditation. So, ideally, in a Mindfulness Yoga practice you would build up to, and devote significant time, to seated meditation…which is usually not the case in the typical public yoga class! If you look back at the ancient texts, the physical asana practice was never meant to stand alone as the full yogic path. It has been noted many times that Patanjali’s Eight Limbs of Yoga, outlined in the Yoga Sutras, include ethical behaviors, asana, pranayama, and ever-subtler experiences of meditation. I think some schools of yoga seem to interpret this as a linear hierarchy, where you have to master the poses before you are ready to attempt meditation. But, there is another school of thought that says we can really benefit from practicing both postural yoga and formal meditation side by side. Start by creating space to connect, then build on that connection. I typically start lying down, or seated, and spend several minutes simply trying to “come home” to the body. This is a check-in time where you notice how the body is feeling, sense the emotional states that may be present, and acknowledge the activity level of your mind at the moment. These observations are judgement-free, and they help you practice in a way that is sensitive to your present-moment reality. Otherwise, you’ll probably just do what you always do, the same way you always do it…which sounds a lot like auto-pilot. So start in a very simple, undemanding shape, where you can establish a connection to the actual feeling of the body and breath, so that you can come back to that more easily during the more complex poses or movements later in your yoga session. In yoga poses, direct attention to the felt sense of the body. The “felt sense” means the real-time sensations in the body, including the obvious ones and the more subtle ones. Take in anything and everything – from the feeling of your hamstrings stretching, to your leg muscles working hard to hold your Warrior pose, to the expansion of your chest on an inhale, to the pressure of your palm touching the floor, or the fabric of your shirt draping over your back. Feeling into the poses this way directs our attention away from concepts and stories about the body and toward a direct experience of the body. Of course, we still want to pay attention to safe alignment, but it’s easy to get caught up in endlessly arranging our parts, rather than ever truly feeling them. Feeling into the direct experience of the body is a huge part of what we do in mindfulness meditation, so we bring this onto the mat when we practice mindful yoga. Experiment with the pace of your practice. Often a “Mindfulness Yoga” practice is on the slower side, but it doesn’t necessarily have to be. Slowing down can help you connect to the felt sense of the body and sustain your focus there, but mindfulness should be present at any tempo, whether you’re doing an intense Vinyasa Flow, a series of static standing poses, or a mellow Yin Yoga session. Be mindful of your intention. Rather than having a goal of mastering a particular pose or working the body out in a certain way, a mindful yoga practice centers around intentions that are more internal and meditative in nature: to awaken embodied awareness and an attitude of kindness toward the body, to strengthen the continuity of mindfulness through all activities, or to see how feelings influence your movements on the mat, for example. There’s a time and place for analyzing and “workshopping” poses, or refining your sequencing, and there’s a time to just feel in a more receptive, inwardly-drawn mode. In a mindful yoga practice, heightening our ability to feel enhances our ability to know change in the body, moment to moment – which leads to insight. From the outside, it may not look all that different from how you already practice. The difference is in how you create space, work with intention, and how you place your attention. This can all look really humble. I like to say that it’s not “show off” yoga, but rather “show up” yoga. In a mindful yoga practice, we are practicing fully showing up for ourselves – and our lives, our fellow humans, and our world. We are setting out to cultivate wisdom on the mat, and to practice asana in a way that supports and leads to seated meditation. Feel free to share any other thoughts or tips for a mindful yoga practice in the comments! This is an interesting (and quick) video with Bo Forbes on the Yoga International website touching on some of the latest findings about how fascia works. If you haven’t run across Bo Forbes before, she is a clinical psychologist, yoga teacher, and integrative yoga therapist whose background includes training in biopsychology, behavioral medicine, sleep disorders, and stress management. She is definitely someone to have on your radar if you are interested in integrating scientific/medical knowledge, as well as mindfulness meditation, with yoga. We Yin Yoga practitioners love to geek out about fascia and talk about how our practice targets and benefits the connective tissues in particular. So, it’s important that we stay up-to-date on the incredible amount of research that’s coming out about our internal interwebs, our amazing matrix, our fascinating fascia. Movement tends to hydrate the tissues more than long-held poses, which is why I like to include a few minutes of gentle one-breath-one-movement poses before diving into the meditative Yin practice. This is not so much to generate heat (warm up), but to hydrate the fascia and help establish embodied awareness, which most people connect with more easily in movement than in stillness. Increasingly, I’ve been exploring how self-massage complements yoga (both Yin and “Yang” forms). This is another way to hydrate the fascia and release places where the web is holding on too tightly. I know this is not a scientific way to describe it, but experientially, when you feel a tender spot or a knot let go in massage, a feeling of greater freedom and integration comes along with it. I sense less of a harsh pull around those spots when I stretch them after working with massage balls. Those spots feel like they’re ready to play nice with the surrounding tissues. And, like movement, massage is an excellent way to heighten awareness of sensation in the body so that we go into our postural practice mindfully plugged in. The Yoga Tune Up therapy balls are great for this, and by the way, I am loving Jill Miller’s new book, The Roll Model, which also includes a section on fascia anatomy. Also, as Bo mentions, props like blocks, blankets, and bolsters help provide some stability in the pose, which signals the nervous system that it’s OK to relax, thus avoiding a “backlash” of resistance in the tissues. The more we learn about how fascia works, the more we understand the huge role that the nervous system plays. The bottom line when it comes to stretching is: less is more! Dial back that intensity. Use prop support when you need it. Enjoy your practice, but don’t overstretch. Gradual, gentle change is more Yin-like anyway. Important food for thought for Yin Yogis…enjoy! Combine a little family button-pushing with a feast of comfort foods, stuffing, and pies, and you’ve got a recipe for holiday indulgence. 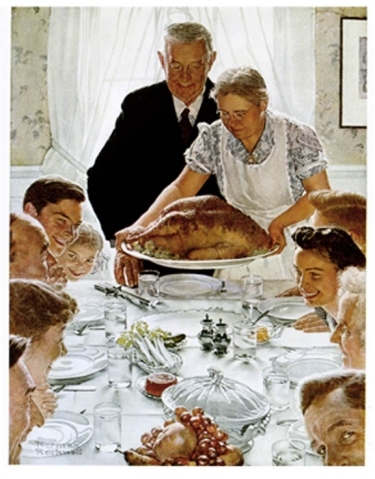 Don’t get me wrong – I savor Thanksgiving dinner as much as the next person, but I try to find a balanced way to celebrate the abundance of the season. The following Yin Yoga sequence doesn’t burn a ton of calories to get that gravy out of your system (I suggest a hike or long walk), but it can help restore you mentally, energetically, and internally. This Thanksgiving-themed practice focuses primarily on the Spleen/Stomach Meridians, with a few Liver/Gallbladder poses thrown in for good measure. The Spleen/Stomach Meridian pair assists with physical digestion, as well as our ability to “digest” whatever happens to us mentally and emotionally. This pair is also associated with the positive attributes of abundance and enough-ness that relate to Thanksgiving, especially because of their connection to the Harvest Season/Earth Element. The Liver/Gallbladder Meridian pair can help us de-tox, since the Liver is the body’s chemical processing center. In Chinese Medicine this also works on the emotional level, as these meridians help us process feisty feelings like anger, frustration, and resentment. It’s a good idea to give your hard-working liver some love after Thanksgiving dinner. Opening Meditation: Lie on your back with knees bent and feet on the floor. Take a few mindful breaths to settle in, then bring your hands to lightly rest on your belly. Feel the belly rise and fall with your breath, continuing to bring awareness to this space for several minutes. Still on your back, take a few Windshield Wiper Twists, moving your knees gently side-to-side with your feet on the ground. Bring one knee into the chest as you stretch the opposite leg out. Switch sides and repeat several times. Come to sitting and practice flexing and extending the spine back and forth a few times (like a seated cat/cow), then side bend left and right a few times, moving with the rhythm of your breath. Release by coming down onto your belly. Wiggle your hips side to side a few times. Release by coming into a neutral position on your back and take a few knee circles in each direction. Squat Pose illustration & instructions from Bernie Clark here. This is a side bend from the seated wide-legged Dragonfly position (not folding forward). The top arm can rest on your head, or can stay down by your side. Release by using your arms and abs to help you sit up. Carefully unfold your legs – bend and straighten the knees a few times. Here’s a video from Bernie Clark on Happy Baby. 10. 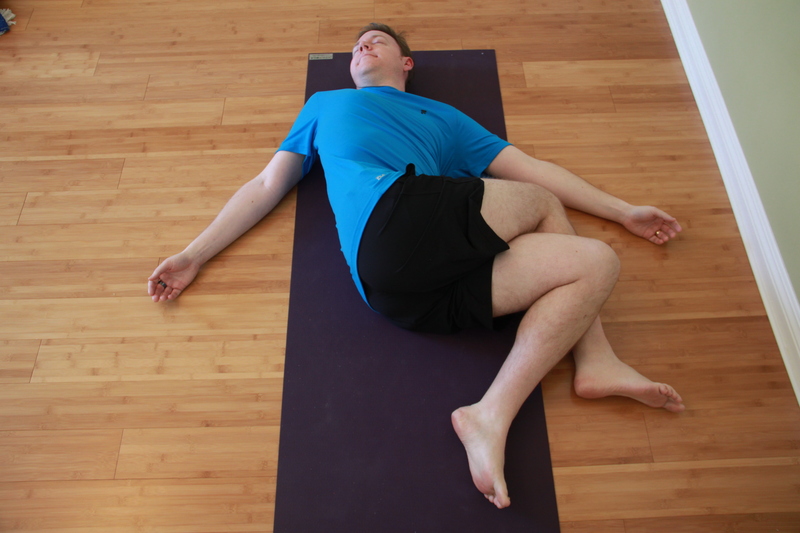 Savasana – Rest for a minimum of 10 minutes. Throughout the practice session, return to the sensation of the breath at the belly. Really allow yourself to feel the movement of the breath at your center, without forcing it. Relax and enjoy! If you need more specific instructions for any of these poses, I recommend looking them up on Bernie Clark’s YouTube Channel. He has a quick and accessible break-down available for pretty much all of the Yin poses. Recently, I was contacted for a quote about Yin Yoga for an article in Whole Life Times Magazine. 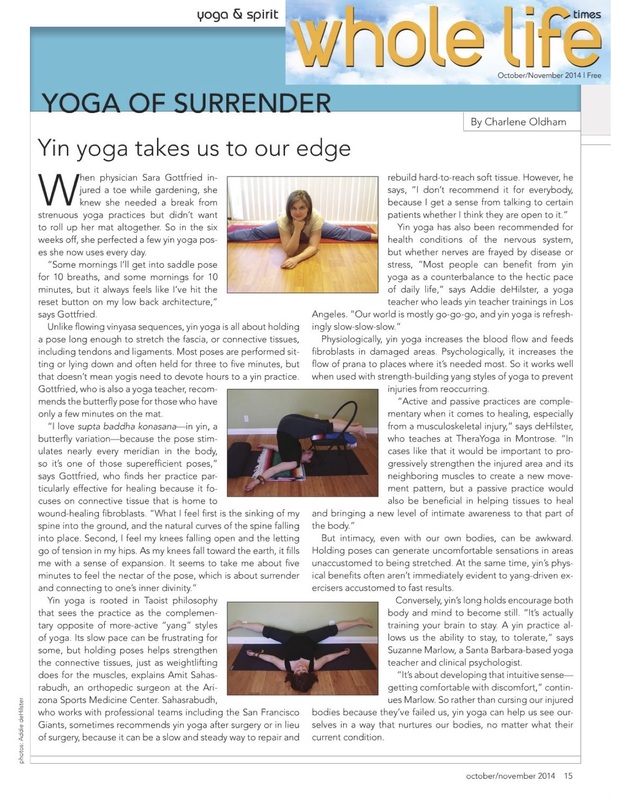 The article, by Charlene Oldham, focuses on the healing aspects of Yin Yoga, and I was honored to be included. You can access the whole issue online here, or check out the Yin article (and my photos!) below.